The Reventazón River, also known as the Rio Reventazón, is quite popular in Costa Rica as the Parismina River or Rio Parismina. Measuring up to a length of 145 km, the river meanders over a large area and ultimately empties into the Caribbean Sea. The waterway has its source in the Meseta Central and moves along numerous valleys including the Turrialba, Reventazón and Orosí Valleys. As the river meanders through the village of Parismina, it gets the name of Rio Parismina. Interestingly, the Reventazón River gets its large volume from the rugged terrains of the Cordillera de Talamanca. The whitewater of the river, however, emerge at the Siquirres, which happens to be placed at an elevation of around 150 feet. Similarly, the rafting range of the river continues for almost 100 km and is studded with interesting rapids all through. 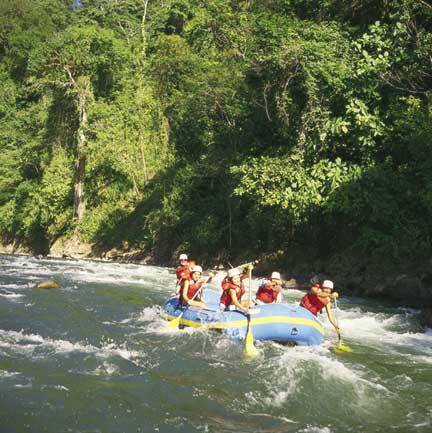 Offering waters of Class III, this tropical river is ideal for first-time paddlers. As the water body moves along the Pascua section, it rewards all its rafters with electrifying rapids such as the “Horrendito”, the “North Sea”, and the “Indigestion”. With several twists and turns present throughout its course, the Reventazón River brings its rafters closer to foaming whitewater. Besides enjoying all the fun and thrill on the mystical waters of the Reventazón River, you can spare a look at the lush vegetation by the riverside. Apart from waging along the amazing waves and getting drenched in the chilling waters, you can plan for a wonderful camping expedition too! Considering the breathtaking scenery as well as the fantastic wildlife by the riverside, the vicinity of the waterway offers the perfect conditions for conducting a camping tour. Hence, get prepared to hit the waters of the Reventazón River. Remember, as the river is famed for its mild curls, it offers the ideal conditions for organizing family trips as well. So, are you ready to embark on one of the most exhilarating rafting adventures of your life? How much is whitewater rafting? What do you wear to go rafting? Can you go Canyoning in the rain? What is a white water rafting experience with Splash, Aberfeldy actually like?